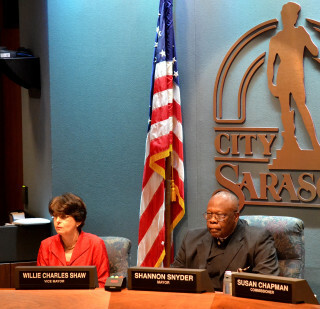 Although they ended up with a unanimous vote in support of the proposal, disagreement arose among the Sarasota city commissioners on Monday, March 21, as they discussed three members’ assertion that a city staff person and a representative of the city’s Parks, Recreation and Environmental Protection (PREP) board serve on a small planning committee focused on the future of 42 bayfront acres. Commissioner Susan Chapman had asked that the matter be put on the agenda. 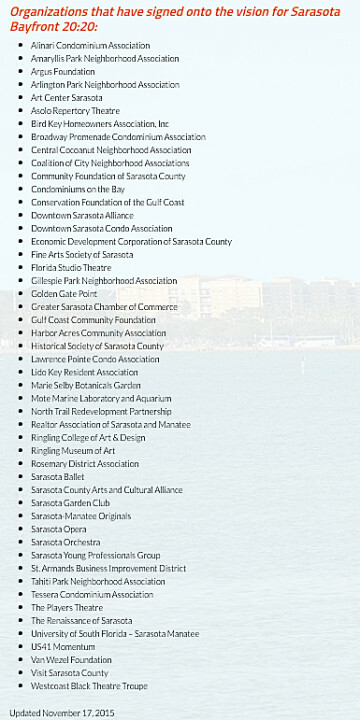 Sarasota 20:20 has been working since late 2013 to create a plan for a cultural arts district on the bayfront, including the prospect of replacing the Van Wezel Performing Arts Hall with a larger facility that could better accommodate programming for local organizations — such as the Sarasota Orchestra and the Sarasota Ballet — as well as the types of performances the Van Wezel already hosts. 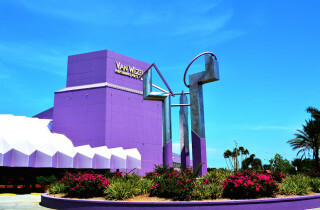 On its website, the organization says it is entering “Phase III Partnership: Master Planning” to reach its goal, which encompasses city property from Boulevard of the Arts to Payne Terminal, surrounding the Van Wezel. “This phase will involve site planning, facility planning, outreach and fundraising,” the website notes. After Chapman raised her concerns during the City Commission’s regular meeting on March 21, Commissioner Liz Alpert responded that Bayfront 20:20 representatives planned to appear again before the board in May with more information about the small planning committee. At that time, Alpert continued, the commission could discuss placing a liaison on that committee. Because no one from Bayfront 20:20 could be present on March 21, she added, it “really is unfair” to discuss the matter further. “I don’t disagree that there should be city involvement,” Alpert told him. Nonetheless, she reiterated that that discussion should be held at a later time, with Bayfront 20:20 leaders present. “I agree thoroughly with Commissioner Alpert,” Vice Mayor Suzanne Atwell said. Deputy City Manager Marlon Brown noted that during the workshop, Bayfront 20:20 leaders said they were not ready to share the membership of the committee. Shaw agreed with Chapman and Freeland Eddie. Then he asked for a motion. Alpert suggested the board state its expectation that the city will be part of the planning process. “I don’t disagree with that, Mayor,” Alpert responded. “I think the city should be the one who says what happens on that property.” Nonetheless, she added, she did not feel the board was at the point where it should specify who will serve as the city representatives on the planning committee. Shaw concurred with her latter comment. Freeland Eddie seconded the motion. Because of Chapman’s insertion of the word “expectation,” Alpert said, she would support the motion. It passed unanimously.